Long gone are the days when watches were used solely for telling time. Based on the number of “arm parties” that are going on, I think it’s safe to say that watches are quickly moving to the forefront of the accessories department. Now considered a regular fixation in the wardrobes of trendsetters everywhere, watches are just as much an accoutrement as your favorite bangles, necklaces and rings. If the last time you donned a watch was when you were six years old (remember that Mickey Mouse watch that was practically glued to your wrist…until you reached fourth grade, that is), then it’s time to invest in a new one! Running the gamut from girly and feminine to carefree and bohemian, there’s no scarcity of timepieces to choose from this season. Here are five watches that will catch even the most anti-watch wearer’s eyes! If your style is girly and feminine, then you need a watch that will fit right in with your ruffled blouses, floral skirts and signature ballerina flats. 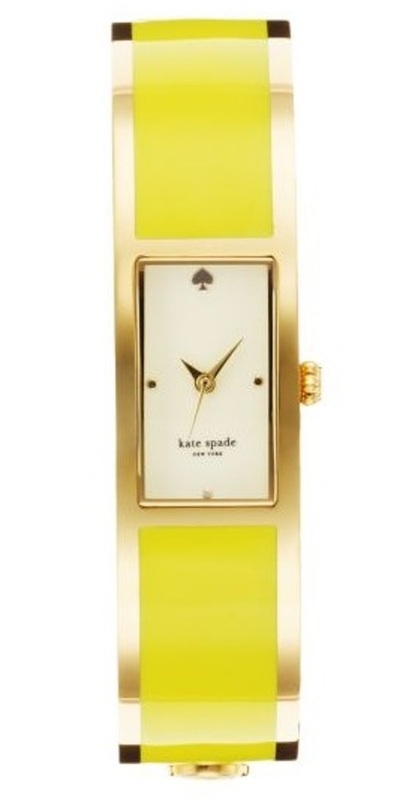 For a bit of whimsy and lots of sophistication, what better brand to turn to than Kate Spade? 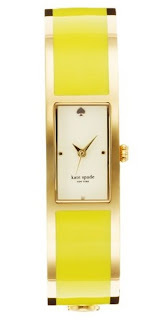 Lucky for you, Kate Spade’s debut watch collection is chock-full of timepieces that are nothing short of perfection. It looks like a bangle, feels like a bangle and cling-clangs like a bangle…BUT it’s more than just a bangle. Doubling as a bangle-watch, the Carousel Bangle (pictured in sunflower yellow) is just the pop of color you’ve been looking for! Crafted of gold-plated metal and enamel and available in an array of equally poppy shades, you are bound to find one that strikes your fancy. Need more reason to completely fall for this bangle? Just check out the sweet inscription inside: “a place in the sun.” Sold! If your style is effortless and trendy, then a menswear-inspired watch will be the perfect accessory to your little black dress or ensemble consisting of a relaxed tee, scarf and skinny leg jeans. From season to season, menswear-inspired watches always seem to be on-trend. 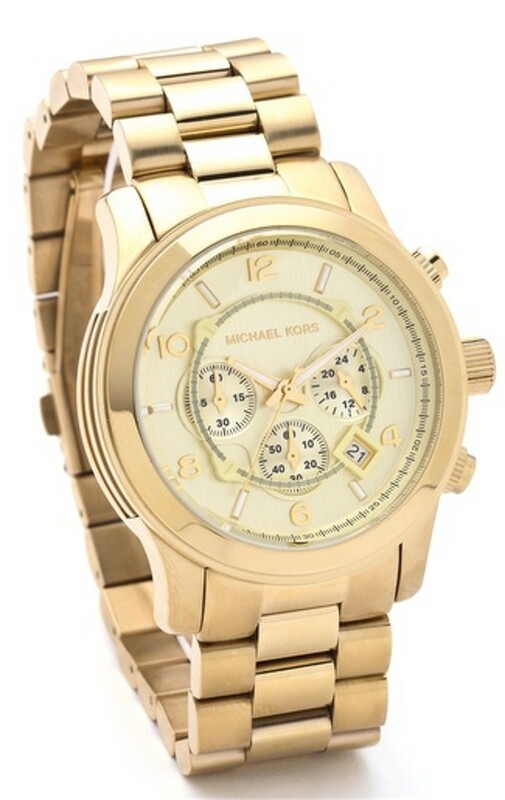 That said, why not make the jump and invest in this must-have oversized watch by Michael Kors? For a conventional watch that is the epitome of class and urban living and that will take you from day to night, look no further. Made of gold-plated stainless steel, this watch is quite possibly the crème de la crème (as far as watches are concerned). 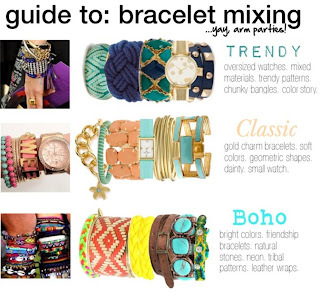 To create some major arm candy, try wearing it with stacked bangles and bracelets in a variety of colors, patterns and materials (see picture below for ideas). Or if you prefer, just wear it as is – after all, nothing is more impeccable than a mega-sized statement watch! Fashion blogger la petite fashionista is right on in her "Guide to: Bracelet Mixing." For a unique and personalized look, see how many different ways you can mix and match your watches! 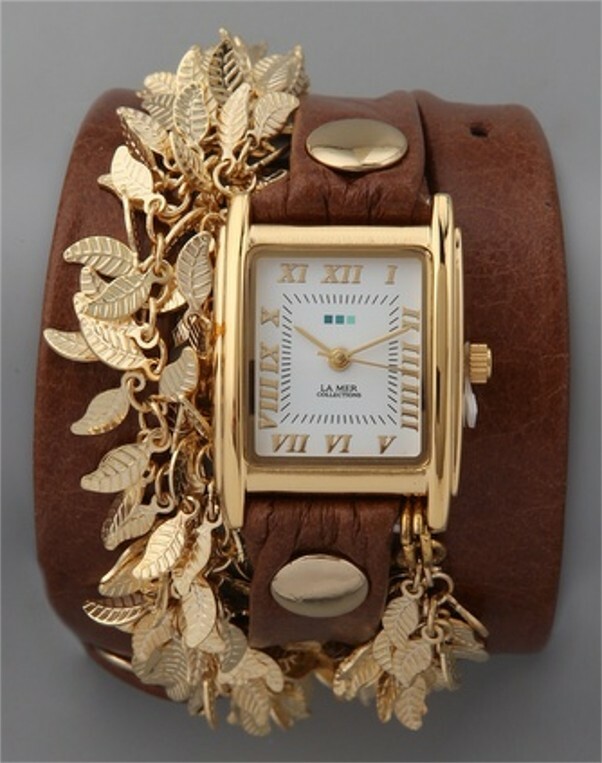 If your style is carefree and bohemian, then opt for a leather wrap-style watch that will convey your earthy roots. 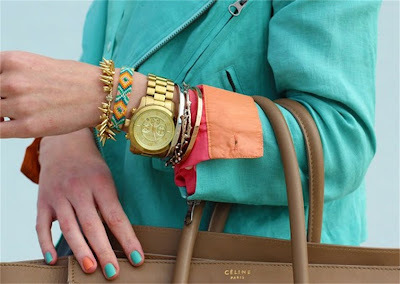 As someone who is a devotee to wrap bracelets, I must admit that I’m already a fan of the wrap-around watch. And who am I to blame? 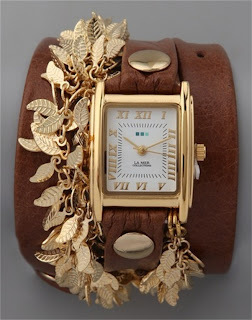 Constructed of Italian leather and embellished with gold-plated leaf chains, this watch by La Mer Collections is simply too charming to pass up. Wear it with a long flyaway cardigan, a printed maxi skirt and lightweight tank top or an effortless blouse tucked into a pair of shorts. As you can see, the outfit possibilities are endless! A wrap watch will tell you the time without cramping your free-spirited style. Martine Ilana, the designer behind La Mer Collections, notes the following about the function of the watches that she designs: "Timepieces set the rhythm of my life, but they remain, above all, pieces of jewelry with which I develop a genuine connection." 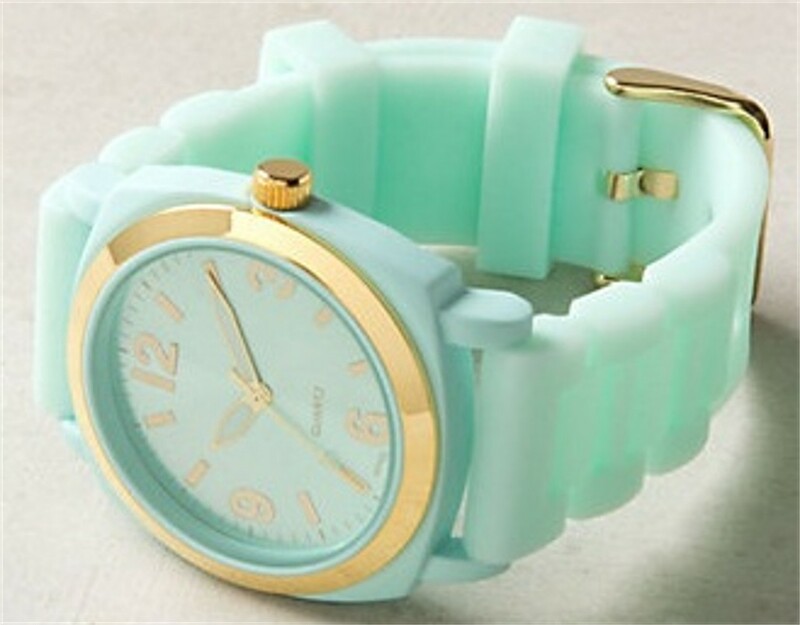 If your style is whimsical and fun, then a watch in a brilliant pastel or neon hue is just what you need to dress colorfully this summer. Think of how fabulous this sky blue gummy strapped watch would look with a crisp white blazer (and sun-kissed skin). Or how ridiculously chic and fierce a yellow one would be when paired with a black lace top. With bold surges of color continuing to be a major runway trend, there’s no time like the present to don a bright-colored watch! If your style is classic and sophisticated, then a timeless, streamlined watch with a modern rectangular face will fit right in with your wardrobe of smart blazers, refined cardigans and pencil skirts. I love how striking, yet still relatively subtle this watch by Fossil is. While it may not scream “look at me,” it is successful in adding a bit of polish to every ensemble. To the savvy and ladylike fashionista, remember, less is more. Watches are as much a means of telling the time as they are fashion accessories. Whether you wear your watch as is or with an armful of stacked bracelets and bangles, one thing’s for sure, it won’t go unnoticed! thanks so much for the mention! i love my arm candy- i have a michael kors white leather watch that i wear almost daily! I've had my eye on those watches:) Great collection!